I am delighted to share my review of Elisabeth Storr’s Call to Juno, the third book in the Tales of Ancient Rome saga, which includes The Wedding Shroud and The Golden Dice. I haven’t read the first two in this series. “Four unforgettable characters are tested during a war between Rome and Etruscan Veii. Caecilia has long been torn between her birthplace of Rome and her adopted city of Veii. Yet faced with mounting danger to her husband, children, and Etruscan freedoms, will her call to destroy Rome succeed? Pinna has clawed her way from prostitute to the concubine of the Roman general Camillus. Deeply in love, can she exert her own power to survive the threat of exposure by those who know her sordid past? Semni, a servant, seeks forgiveness for a past betrayal. Will she redeem herself so she can marry the man she loves? Marcus, a Roman tribune, is tormented by unrequited love for another soldier. Can he find strength to choose between his cousin Caecilia and his fidelity to Rome? Call to Juno opens on a simple domestic scene, a mother watching over her squabbling children. A scene universal and timeless, yet one that is situated firmly in an Etruscan court. All the indicators are present, in the richly described and meticulously accurate details of the setting, the reader left in no doubt that she has been transported back to ancient Roman times. In this fashion the third in Storr’s series is staged, as Caecilia, a Roman treaty bride, helps her husband Vel Mastarna prepare for an important ceremony. The reader is led through the details of the previous titles in the series with finesse. If at first the various characters are confusing, the story soon settles in and the drama plays out. The battle scenes are depicted in fine detail, themes of love, betrayal, fate and destiny deftly handled, and the characters carefully crafted and believable. It is refreshing to read of Roman times from a distinctly feminine perspective, one that captures the intimacy of motherhood and domesticity as much as it does the political horrors of war. Storrs maintains narrative control throughout, displaying that necessary skill of the historical fiction author, a deep empathy with the times she has chosen to set her work. This is a story for those who enjoy their historical fiction rich with fine and accurate detail. 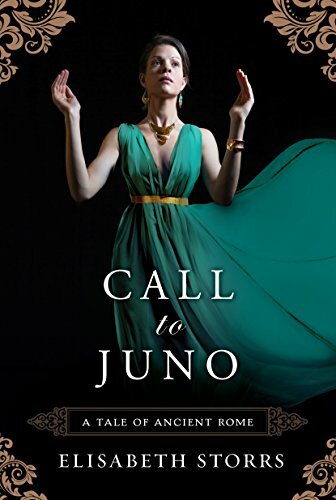 Call to Juno is intensely visual, bringing ancient Rome to life, composed by an author who clearly knows her subject. Next Post Writers chat writing – my debut vlog appearance!